Robert James Mitchell was brought up in Stirling where he attended Riverside Primary school between 1972 and 1979 before moving onto Wallace High School. Mitchell was initially detailed beat duties out of the former Blackhill Police Office and then Baird Street Police Office in the former ‘D’ Division, or the North, as it was known to all the men who served in the division. The author still cherishes his first set of shoulder numerals which were D325. In August 2001, having already started to enjoy an increasingly successful freelance sports journalist career under the name of Bob James, which included exclusive interviews with Mike Tyson and Lennox Lewis, Mitchell resigned from Strathclyde Police and took up a full-time position as sportswriter with the Airdrie and Coatbridge Advertiser while continuing to freelance. In January, 2004, Mitchell formally joined the sports staff of the Glasgow Evening Times as a sportswriter where he continues to be employed with core responsibilities as the paper’s boxing and rugby writer and SPL football correspondent. In January, 2007, while recovering from an appendicitis, Mitchell decided to write the first draft of ‘Parallel Lines: The Glasgow Supremacy‘, a crime thriller set in Glasgow in the recent past, drawing heavily on his own experiences and featuring the characters of Detective Sergeant Gus Thoroughgood and DC Kenny Hardie. After a myriad of rejections the novel was published in spring 2011, by the Strategic Book Group, New York. In July, 2011, the ebook of the same novel was published by Fledgling Press of Edinburgh, for whom it is the top selling ebook. In January, 2012, RJ Mitchell signed a contract with Fledgling for full rights to the follow up entitled ‘The Hurting: The Glasgow Terror’ which was published in all formats in July 2012. The Hurting was nominated for The People’s Book Prize but failed to make the grand final short list. In 2013 the third book in the DS Thoroughgood series, The Longest Shadow, was also published by Fledgling Press. In 2014 Fledgling Press secured the paperback rights for Parallel Lines and Thoroughgood’s maiden outing was finally available in all UK stores. 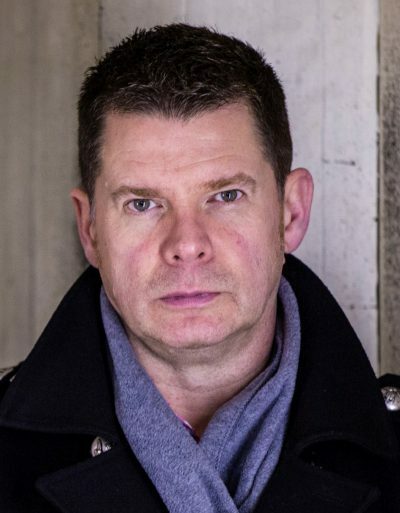 In 2015 Mitchell undertook a 12-stop Scottish signing tour with WHSmith on which he sold 527 books, a record for a relatively unknown crime author. In 2016 the fourth outing in the Thoroughgood series, The Shift, was published by McNidder & Grace and Mitchell embarked on an 18 stop Scottish signing tour, covering all Scotland’s major cities, with WHSmith on which he sold a record 1067 books. This was WHSmith’s highest grossing Scottish signing tour that year. In May 2017 The Shift was nominated for The People’s Book Prize and this time made the grand final at The Stationer’s Hall, London, which was hosted by Sir Frederick Forsyth CBE. Sadly despite polling 11,000 votes, the Thoroughgood prequel set in 1989 and based on Mitchell’s horrific police probationary period, finished runner-up. In October 2017, Mitchell signed a two book deal with Nine Elms, the crime imprint of Benefactum Publishing, to launch the adventures of disgraced former SAS hero Ludovic Fear. In December 2017 Mitchell sold 283 books on a four stop pre-Christmas tour with WHSmith. On June 1 The Shadow of Fear, the first Ludovic Fear outing is due to be published, with launch dates in Stirling on June 7 & Glasgow on June 24. Mitchell has also agreed a daunting 30-stop Scottish signing tour with WHSmith which starts on June 9 in his hometown of Stirling.